LONDON, 3 SEPTEMBER – Film fans are being given the chance to literally be transported to London’s IMAX theatres to celebrate the release of THE TRANSPORTER: REFUELLED this Friday. A sharp-suited Transporter and his three seductive sidekicks in platinum blonde wigs will roam the London streets in a stylish black car, transporting valuable cargo to eagle eyed fans of the hit series. Anyone who spots the characters at one of their check-points and tweets a photo will be in with a chance to win one of three TRANSPORTER prizes, including the ride of their lives to the thrilling new film on one of London’s IMAX screens. From 12.30pm on Friday 4th September – the day THE TRANSPORTER: REFUELLED hits IMAX screens across the country – the Transporter team will travel around London, stopping at various locations posting clues as to their whereabouts on IMAX’s Twitter page. To be in with a chance of winning one of the prizes, anyone who spots them simply needs to tweet a picture of the car and its passengers with the hashtag #IMAXTransportMe, tagging @IMAX (https://twitter.com/IMAX). Winners will be selected at random and each given a secret pick-up location where the Transporter will be waiting for them with their prize. 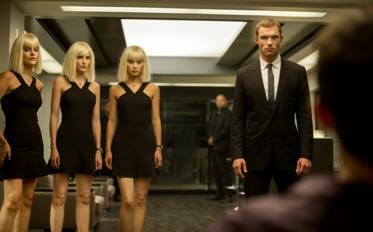 Each of the three femme fatales will be armed with a briefcase – some containing IMAX tickets to see the film, some containing THE TRANSPORTER REFUELLED or IMAX goodies and one containing an Audi super car race track day. IMAX ticket winners will get the chance to experience the full IMAX upgrade as they are transported by the team, in style, directly to the local IMAX to see THE TRANSPORTER: REFUELLED on its day of release. From the producers of the TAKEN trilogy, THE TRANSPORTER: REFUELLED is the high octane new thriller starring Ed Skrein as a former special-ops mercenary transporting classified packages to questionable people. Transport yourself to see it on IMAX screens this Friday. From the producers of LUCY and the TAKEN trilogy, THE TRANSPORTER REFUELLED is a fresh personification of the iconic role of Frank Martin, that launches the high-octane franchise into the present-day and introduces it to the next generation of thrill-seekers.